As was mentioned in the listing, dominoes were popular in the mid-nineteenth century. 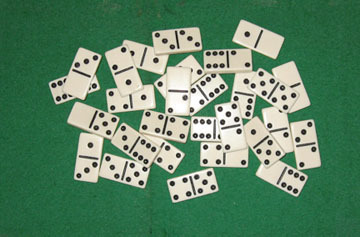 Period dominoes were either bone, ivory, or a sandwich of ebony and either bone or ivory with a pin in the middle to help hold the two slices of each piece together. They came in a variety of sizes ranging from tiny to approximately the size of modern doinoes. The all ebony/all black dominoes came later. The dominoes we carry simulate bone or ivory. They are made, we admit, of plastic because ivory would generally be illegal or, if legal ivory could be obtained, prohibitively expensive to obtain pieces large enought for dominoes. But, the simulation of ivory is very good with the pieces in an off-white shade. Dominoes were one of the games included in Milton Bradley's package of "Games for the Soldiers" that were sold to provide wholesome pursuits for the soldiers during their spare time in camp. There were also magic tricks that could be performed with the dominoes.